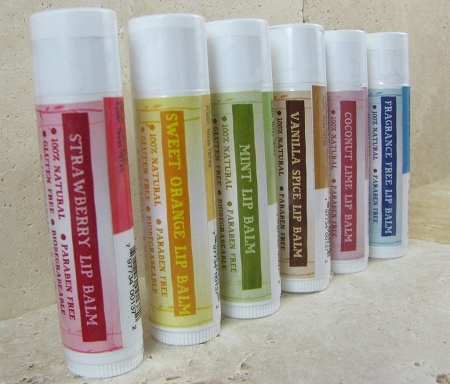 Lip Balm - 0.15oz This is one of our best selling balms. Is has sweet orange oil added for that awesome "old school" orange flavor. It smells like a fresh juicy orange. Citrus oils are tauted for there ability to lift the mood by increasing serotonin not to mention the antioxidant effects of vitamin C. Our lip balms contain no petroleum products, only vegetable oils to sooth your lips. They come in nine flavors: Lavender Hemp, Mint, Sweet Orange, Vanilla Spice, Strawberry, Coconut Lime, Honey Almond, Pumpkin Spice and Fragrance Free. INGREDIENTS: oils of olive (olea europaea), organic extra virgin coconut (cocos nucifera), flax seed (linum usitatissmum), castor (ricinus communis), shea butter (butyrospermum parkii), beeswax, candellia wax, vit e (natural tocopherol), zinc oxide, stevia extract (eupatorium rebaudianum bertoni), annatto seed extract (bixa orellana), sweet orange essential oil.